Since Slide.com is down I can’t embed the slideshow of the Jewelry Expo Booths, but here’s the link to the Flickr slideshow. Some of the booths themselves are works of art. Don’t forget that at the Jewelry Expo there will be donations kiosk for the Red Cross. This money goes for a good cause and supports their efforts such as disaster relief, military family support, blood donations, as well as educational classes such as CPR and first aid. And when donations in the kiosks total L$50,000 I will run around the sim as RUTH. Miriel was kind enough to script the donations kiosks to display total donations instead of the individual kiosks. As of the time I’m writing this they are at L$16,726. So only L$33,274 to go. And I got an email this morning with a teaser for an Yves Saint Laurent event. 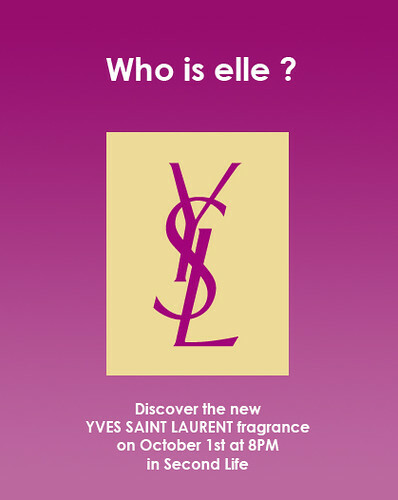 On October 1 at 8 PM there is an event introducing elle the new fragrance at the YSL elle island. And on a side note, I’m having no end of trouble trying to get web pages to load today. ETD is closing tonight at midnight. It is expected to be closed approximately 2 days. Elika’s preparing it for a clearance sale. Keep a watch on the ETD update group or the ETD blog for more details. Grace Winnfield announced the 5 models who will be the Face of Grace. Congratulations ladies. Marleys has a L$1 hair package. 4 Days left to submit ads for the Shopping Directory. You can also join the group “Fashion Shopping Directory” in world for instant delivery. You are currently browsing the SALE! category at SL Fashion Notes.